TWO tycoons and a royalty will go ahead and build the RM2.5 billion Four Seasons Place in Kuala Lumpur although a global economic crisis threatens to hurt demand for expensive hotels and apartments. The much awaited property, located next to the Petronas Twin Towers, will be ready in 2012, says its developer Tan Sri Syed Yusof Syed Nasir. It comprises a hotel, apartments and a mall, and will be the world's tallest Four Seasons development. 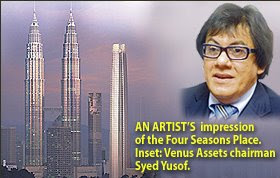 Four Seasons Place is being built by Venus Assets Sdn Bhd, a firm controlled by Ipoh-born tycoon Ong Beng Seng, Syed Yusof and the Sultan of Selangor. "We are committed to the project even during the downturn as it has a huge multiplier effect," Venus Assets chairman Syed Yusof told Business Times in a rare interview. It expects to hire contractors for the building in the third quarter of the year. Venus Assets bought the prime 1.05ha site for RM90 million in 2003 from the estate of the late Khoo Teck Puat, the former major shareholder of Standard Chartered plc, a British bank. "We received the development order (last December) and we are now evaluating various proposals from the contractors to do the job. We have completed piling works, he said. Piling work for the building, located between Wisma Central and Menara Maxis, started in 2007, two years after the project was announced. "There was a pause in the project only because we were redesigning the building in terms of positioning and the composition. "Previously, the Four Seasons was supposed to encompass two towers, but now it will all be a single 65-storey tower," Syed Yusof said. The redesigning meant a new proposal had to be submitted to the authorities for approvals and it took time to obtain the green light. The building, described as futuristic and sleek, will complement the Twin Towers and enhance the Kuala Lumpur skyline. "We have included a 150,000 sq ft of retail component into the tower. The hotel will have 250 keys of which 150 are hotel rooms and 100 serviced apartments. "There will also be 140 units of apartments which will be sold," Syed Yusof said. The entire component will be ready simultaneously and will be managed by Four Seasons. The apartments, which start from 3,000 sq ft per unit, will be sold for about RM2,500 per sq ft.
"The cost of construction for all components including land and interior design is RM1.4 billion and the estimated gross development value of the project is RM2.5 billion," Syed Yusof said. When asked what kind of average room rate the hotel may fetch when ready, he said, "Four Seasons is a rate leader with rates which are usually 20 per cent to 30 per cent higher that the existing rate leaders," he said. The rate leader in Kuala Lumpur City Centre currently garners between RM600 to RM700 in ARR. This means that Four Seasons may lift the bar to between RM800 and RM900 per night. PETALING JAYA: The real estate fraternity has mixed views about the price tags of RM30mil and RM25mil that Glomac Bhd is asking for its Kelana Business Centre and Glomac Business Centre respectively. A valuer said it seemed to be comparatively higher than the ones sold earlier which were on a strata basis. Two agents said the prices were not high.Glomac had, in February, said it was putting up for sale the two business centres located in Kelana Jaya to increase its war chest to prepare the company in the event the economy took a turn for the worst. About a month ago, it announced that it had sold its 12-storey Wisma Glomac 3, also in Kelana Jaya where it is headquartered, to Perbadanan Nasional Bhd (PNS) for RM50mil. It is now a tenant in the building. Group executive vice-chairman Datuk Richard Fong said: “We would like to strengthen our cash position in light of the current economic scenario and to make the necessary preparations for the future. Glomac’s total bank borrowings have reached RM311mil. Fong said the company had held on to Kelana Business Centre and Glomac Business Centre for 12 to 13 years. The rental yields from both are about 7.5% annually. At RM25mil and RM30mil, a source said, the price would work out to RM265 and RM270 per sq ft respectively. Another source said there might be a premium because maintenance and control would be in the hands of the landlord. Rentals payable could be relatively higher as some units might be upgraded from the standard lots, and there might also be provision for centralised air conditioning, he said. He also said that rentals would remain stable for now but might be pressured downwards when new stocks were added to the market. Oasis from the Sime Darby Brunsfield group, Symphony House from the PuncakDana Group and new buildings from the Titijaya and Empire Groups in Subang Jaya will be added to the market this year and next. 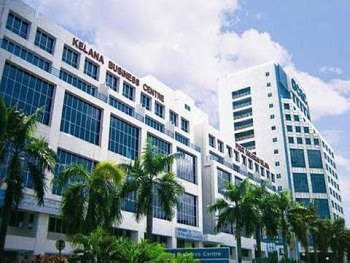 The Glomac Business Centre has 300 to 350 parking bays while the Kelana Business Centre has over 400. Both are quite well-tenanted. Glomac may move to the 15-storey Glomac Tower located next to Taman Tun Dr Ismail, which it is building. Glomac Tower is part of an RM800mil mixed development, Glomac Damansara, which sits on seven acres. Besides letting go of its assets, the company will continue to launch its projects, though in smaller blocks. It has projects in Sg Buloh, Johor Baru and Rawang. Instead of double-storey terrace housing, it may also opt to change that to single-storey housing. As for Glomac Damansara, which it plans to launch in about two weeks, the company will be offering competitive rates. The offer includes a 10% downpayment and 90% financing. The 140 units of luxury apartments at the Four Seasons Place may fetch as much as RM1.4 billion in sales when they are launched in the third quarter of the year. "The 140 units will be sold for about RM2,500 psf. The smallest unit size starts at 3,000 sq ft," said Tan Sri Syed Yusof Syed Nasir, chairman of developer Venus Assets Sdn Bhd. The 65-storey tower will also have apartments which are 5,000 sq ft and 7,500 sq ft in size. Total saleable area is 560,000 sq ft. The only two available penthouses have already been reserved. The developer is confident of selling the units at that price, despite the gloomy economic outlook, as they have received good response from investors in North Asia, India, Singapore and the Middle East. PROPERTY developer Hua Yang Bhd has sold a piece of land in Bandar Universiti Seri Iskandar, Perak to British retailer Tesco Stores (Malaysia) Sdn Bhd for RM3.2 million. The deal was done by Hua Yang's wholly-owned subsidiary Agro-Mod Industries Sdn Bhd. The land measures 215,186.4 sq ft, Hua Yang said in a statement. The 838-acre Bandar Universiti Seri Iskandar township was first developed in 1999 with a gross development value of RM616 million, to cater to the growing university student population of Perak. The newly proposed Low Cost Carrier Terminal (LCCT) to be built by Malaysia Airports Holdings Bhd is expected to start construction by the middle of this year and completed by the third quarter of 2011. The airport, which will cost RM2 billion, is expected to be fully operational after that and would be able to cater to 30 million passengers per annum (mppa), with the potential to expand to 45 mppa, MAHB managing director Datuk Seri Bashir Ahmad said today. He said the full cost of the project, of which its construction would be done via open tender, would be borne by MAHB via loans. "We will be funding it via loans as we have no debt right now. We have received letters of offer (for loans)," he told reporters at a briefing in Petaling Jaya. The current LCCT would be converted into a cargo terminal, he added. He said the cost of the LCCT included a 150,000 sq m new terminal building located 1.5 km west of the main terminal, 70 bays of aircraft parking, a proposed third runway which will be situated only 1.5 km from the second runway, and full parallel taxiways for quick turnaround between both runways. Bashir said the airport operator was in talks with AirAsia Bhd about the project and added that the low-cost airline was pleased with the progress. "AirAsia will enjoy greater operational efficiency with the second and proposed third runway just 1.5 km apart. The proposed new runway is also big enough for a B747 to land," he said. He added that they were also in talks with Express Rail Link Sdn Bhd to extend the connection to the new proposed LCCT, although it would not be included in the total cost of the project. Asked on why MAHB's cost was bigger than the one proposed earlier for the Labu LCCT, Bashir said this LCCT was bigger and has taken into account passengers comfort in the long-term. If needed, an adjacent parcel of land to the proposed site could be used for further expansion and could cater for another 25 million passengers. He added that the soft ground on which the new terminal was to be built was also not a cause for concern as both the existing runways and Bunga Raya Complex were also located on soft ground. Basir also denied that the issue of Labu LCCT had prompted MAHB to speed up the progress of this new LCCT. "It took us 16 months to study this and the deadline for it was last December. We did it (study) professionally," he said. On another note, Bashir said MAH had also proposed to the government the 50 per cent rebate on landing charges as announced in the recent Second Stimulus Package. He said the rebate, applicable to all airlines, would be of help as the airline industry was going through a difficult time. "However, this won't affect our bottomline as we are working with the government on a revenue sharing basis for the landing charges," he said. MAHB makes about RM180-200 million annually from landing charges. Asked if the airport operator would be reducing other costs such as airport tax since the proposed terminal was for low-cost business, Bashir said aeronautical charges (such as landing and parking fees and tax) would be decided by the government. He also anticipated that all airports operated by MAHB would have zero per cent growth this year due to the current economic slowdown that has affected passenger movement generally. However, Bashir expects MAHB to remain profitable following other businesses such as retail. WASHINGTON: Despite halts on new foreclosures by several major lenders, the number of US households threatened with losing their homes rose 30 per cent in February from last year's levels, RealtyTrac reported yesterday. Nationwide, nearly 291,000 homes received at least one foreclosure-related notice last month, up 6 per cent from January, according to the Irvine, California-based company. While foreclosures are highly concentrated in the Western states and Florida, the problem is spreading to states like Idaho, Illinois and Oregon as the US economy worsens. "It doesn't bode well," for the embattled US housing market, said Rick Sharga, vice-president for marketing at RealtyTrac, a foreclosure listing firm. "At least for the foreseeable future, it's going to continue to be pretty ugly." The rise in foreclosure filings came despite temporary halts to foreclosures by Fannie Mae and Freddie Mac, and major banks JPMorgan Chase, Morgan Stanley, Citigroup and Bank of America. Freddie Mac, the US mortgage- finance company seized by regulators six months ago, said yesterday it needs more financial help from the government and raised doubts about its ability to become profitable again. Freddie's decision on Wednesday to tap an additional US$31 billion (US$1 = RM3.69) in aid in return for preferred stock will raise its annual dividend payment to the Treasury to US$4.6 billion, a figure the McLean, Virginia-based company said may be beyond its means.